Another area I seem to be constantly working on organizing is money. Which account is it in? How much do I have left? Terrible. This is silly really, as I don't have a lot of money that I need to worry about. I have no paycheck, and now that we have reorganized our bank accounts to take care of joint household bills, I am certainly not dealing with huge amounts! I take out a set amount of money each month for groceries, stuff for the boys, gas and a little pocket money for myself. The problem is that I always seem to get to the end of the money before I get to the end of the month. My hubbie and folks like Dave Ramsey have it right - they use CASH. Cash is king apparently and I never knew it. So in order to simplify, I am going to go cardless and use cash. But I didn't know how I should organize all this cash since I never really carried any before! Kelleigh Ratzlaff to the rescue! This papercrafting designer has a great tutorial and pattern to create your own cash envelopes. This tutorial has been linked to so many times on the blogs I follow that I truly do not know how I found this project but I am so glad I did! I downloaded Kelleigh's template and created 6 pretty envelopes from my scrapbooking papers that I can organize and keep my cash in. It was an easy project with very satisfying results. I have used the envelopes for the past couple of weeks and it's a pretty simple system. Put the money in. Use the money. Put the receipts in the envelope. When the money is gone, the money is gone. And so far I am staying on track with it. 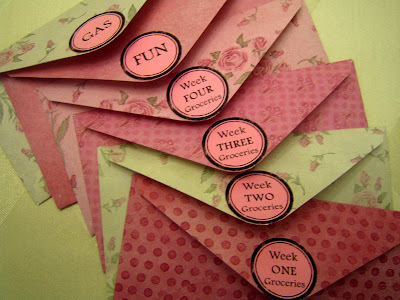 If you think these would help you, do go to Kelleigh's blog and check out more of her cute templates!